Thank you so very much for your talk to our congregation on Sunday, December 15. Your humor and frank approach to the often contentious topic of “Palestine and Israel: Why There Is No Peace” was well received and much appreciated. You handled very difficult questions with honesty and clarity and kept the audience engaged. After you left, a number of people expressed their appreciation for your visit. One gentleman in his 80s said, “I usually don’t go to talks like this, but I’m very glad I came to this one”. On behalf of the First Unitarian Church, thank you! Thank you so much for helping make our 77th Annual Convention in Chicago a big success this year. The presentation you put together on “The Syrian /Lebanese on the Titanic” for our Thursday night reception was wonderful. Many of our attendees commented to me how much they enjoyed it. It was very interesting and insightful. We loved the way you brought each of the names to life. Your comedy performed at our Saturday night banquet was hilarious. I received many compliments for including you as part of our program. Many felt it was our best program. Your jokes were appropriate and easy to relate to which made them even funnier. I was watching the crowd as you were speaking and could see how hard they were laughing. I knew you were the right one to have complete our program. I also appreciate how friendly you are and how easy you are to work with. You have such a long list of talents and credentials, and yet you are a warm, humble person who made me immediately feel like we had been friends for a long time. You were always ready and willing to help me with whatever I needed. You were awesome! Many thanks Ray for your terrific talk today for our Roosevelt University Institute for Continued Learning group. As you know, this is a group of bright, well traveled seniors who are lifelong learners. I heard so many accolades about your talk, especially the humor, but also about the extremely knowledgeable way you handled difficult questions on the Middle East. Your warm easy style was appreciated by over 220 attendees who were most anxious to learn more in depth about your topic. I hope you will come back to give us more insight into world affairs. Also, thank you for donating your books. I have sent them to our tech. services department, they deal with adding new items to our collection, to add into circulation. Thank you for your masterful presentation on Sunday. You were entertaining, informative and principled throughout. You handled all the questions with grace and communicated many important points. I laughed hard at your humor and heard nothing but enthusiastic responses from the audience (which, by the way, was one of our largest this year). Your talk reinforced for me how much Israel/Palestine is a mirror for issues of American identity, particularly, that formative and chronic concept of race. Your analysis of moderates vs. extremists allowed the audience to get past the hot button issues and take the time to look at issues of racism, harmonizing their American, democratic values with their attitudes on Israel/Palestine. Special thanks to columnist Ray Hanania for his humorous and stimulating presentation to our ‘Behind the Headlines’ class at the Renaissance Academy of St. Xavier University. His wit and knowledge kept our group intellectually stimulated for more than one hour. As an Aspect Foundation coordinator, I recently brought a group of 36 exchange students and their host families to Chicago. The highlight of our trip was a tour of Arab Chicagoland with Ray Hanania. Ray entertained and educated us for several hours. His way of weaving together lessons on the history of Arabs in the United States and Arab culture in general with a hilarious comedy routine is amazing. His jokes are really funny, but more importantly, they get people really engaged and thinking about serious issues that affect people of all races and religions throughout the world. Ray really connected with the teenage students as well as the adults in our group. Many commented on how funny and awesome Ray is in his presentation. Everyone appreciated the chance to see a neighborhood settled by people of Arab descent and more importantly to learn about the issues that affect Arab Americans. Ray has a unique way of trying to bridge the gaps that remain between people of different cultural backgrounds. I would recommend Ray Hanania and his tour of Arab Chicagoland to everyone wanting to spend a few hours laughing and learning about cultural issues important to the whole world. Your show exceeded our expectations. I had numerous positive comments and compliments about your humorous performance from the doctors and the rest of the audience. You worked the audience very well. You kept them laughing. They were engaged. The topics were relevant and exciting. They were non-offensive to our community of Muslims and Arabs. … One doctor several weeks ago was skeptical. This doctor, let us say, was not a fan of yours. But a few days following the show, I received a message from the doctor expressing to me how entertaining you were and how much the doctor enjoyed your performance. In short, you were FANTASTIC! “Our members and guests enjoyed your comedy which was very funny and yet very tasteful, as well as very real in addressing current issues that we face as Arab Americans. 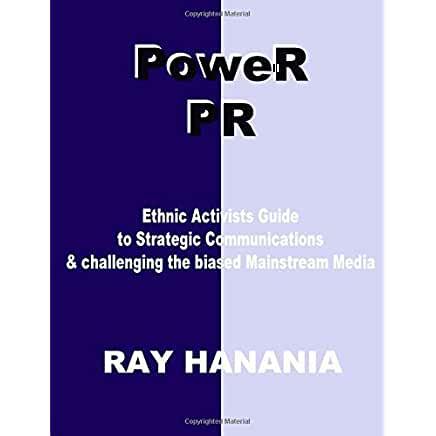 “Ray Hanania, a frequent contributor to The Arab American News and a well-known stand-up comedian, entertained the crowd with jokes that ‘hit home’. “a great show. I have talked to the people of or funding committee and some friends who joined us that night. Everyone enjoyed your show very much. You have depicted really well the situation of the Muslims around here after 9/11. I hope we could convey the messages to the people through your act that we are human like others and we do not nurture crimes or are criminal. “Your message was very poignant. Humor is a great way to cut across boundaries as you definitely demonstrated at your show. please keep up the great work. You are an inspiration to us all. Radio host, Wha’d ya know? So why did Jackie Mason, an outspoken supporter of Israel, refuse to allow Ray Hanania, an Arab-American comedian, newspaper columnist, and Vietnam Veteran, to open for him at a recent performance in Chicago? “I just have to tell you that as a big NPR listener, I’ve heard quite a bit of you lately (on with Michael Feldman and tonight on WBUR)…and I think you’re hilarious! Your comedy is wonderful, and I hope you come to Massachusetts sometime. It was a great show on “On Point” tonight, and you were a highlight. Oak Lawn High school presentation to students on journalism and writing careers. Read letter? Indian Trails Library, Wheeling, Illinois on “Arabs of Chicagoland” presentation May 2008. View letter? Presentation on defining the moderate Arab voice and fighting extremism in the Arab, Muslim community in the United States. Read letter? Letter of Recommendation/Review of Israeli-Palestinian Comedy Tour performance 3-12-08 Show Read it? THIS POST HAS BEEN READ 5059 TIMES SO FAR. THANK YOU!